Kids are fantastic. They’re full of energy, joy, excitement, and adventure. Unfortunately, what frequently happens is that we as parents are too tired or out of shape to join them on their quests for fun and learning. And that rubs off on the kids. Or we want our kids to have stuff that we never had – we had dreams of being a college soccer player, for example, and divert that unfulfilled wish onto our kids as we funnel them in unending practices and camps and the like to help them become that great player we always wished to be. Until we push them too far and they get hurt or discouraged, and they quit (my friend Jeff Turner is an absolute expert at helping kids overcome these issues – check out his work at Fit2Play). While I would never venture to suggest that we can keep up with our kids entirely (they’re built to be balls of energy, after all! ), using our Mudlife Crises to be a positive example for our kids can be a big boost to their lives from a physical, mental, emotional, and developmental standpoint. And we can do that just by including them in what we do. The best exercise is about play, there’s no doubt. It makes us happier, healthier, more “functionally fit,” and the best part is that it’s easy for the whole family to take part in. Say your kids are crawling around on the floor or ground. Get down there and crawl with them, for crying out loud. Let them jump on your back and give them rides. See if you can crawl under the same chairs they do, and laugh out loud when you’re just too big. Climb trees with them. Help them climb trees, rocks, hills, etc. Let them crawl into the mud – and do it with them. Wade streams. Run through the surf with them. Toss them around the pool. And here’s another tip for you when and if you decide to take part in an obstacle course race: bring your kids with you. 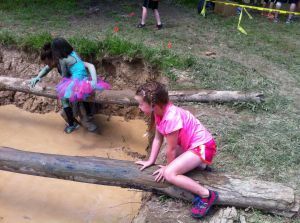 Many of the races have kids’ events that are scaled-down versions of the obstacles you just overcame, so the kids can have fun and get muddy, too. Daughter tackles the mud at Ruckus Columbus! One of my favorite “Dad” memories is when I ran the Ruckus race in 2011. That was a hard race, no doubt. But one of the best parts of the race had nothing to do with me, and everything to do with my daughter. Daughter was not quite four at that point, mind you. Ruckus was the second race I ever ran, and lo and behold, they had a kids’ race, with stuff to climb over, run around, and was highlighted by a big mud pit. I was running along next to Daughter as she tackled the course, climbing over hay bales, through tunnels, etc. And then we came to the mud pit. She climbed up on to the hay bale in front of the mud and stopped cold in front of it, giving me a hesitant look of “what do I do now, Daddy?” And when I told her that it was okay for her to jump in the mud and go, an absolutely HUGE smile crossed her face, and she jumped right in. You can see her awesome smile in the picture to the left (in which she’s wearing a Warrior Dash shirt we bought her at my first race). Her cute little pink sneakers were trashed, and the little flower-pattern shorts she had never emerged from the laundry completely clean again in their existence. But she had a ball. And she and I bragged about how muddy we got during our races the rest of the day. Daughter attacking the Mud Ninja! The really special thing about that event, though, was that it stuck with her. I now have a little girl who is as girly-girl as they come – loves pink, dressing up her dolls, doing crafts, and the whole nine yards. 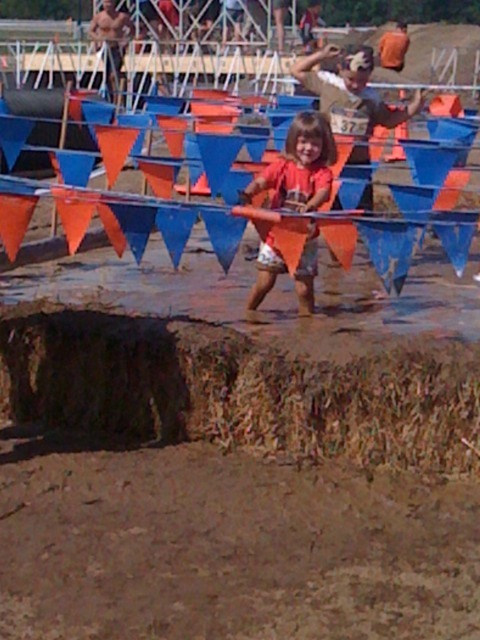 But she also takes part regularly in all the mud races that we go to as a family, including the Mud Ninja race (picture of the most recent race to the right). She’s all decked out in her pink finest, as you can see, but is still attacking that muddy mess with the best of them! And check out the little girl behind her on the log – wearing a tutu and made up. 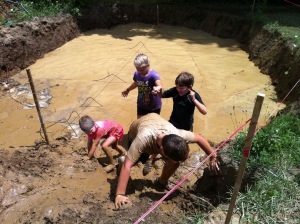 These kids are just having great fun, getting dirty, overcoming mental and physical boundaries, and being healthy! Son takes on the Mud Ninja course with some help from a new friend. And just like with the adult races, the kids all help each other to overcome the harder obstacles. I will never forget the first time we did the Mud Ninja kids’ race. Daughter was having no issues, but my son was having some sensory issues with the race due to his autism. Before we could help him as he struggled to get across one of the pits, a girl who didn’t know him at all stopped running with her friends and started helping him. She stuck by him for the entire remainder of the course and made sure that he had fun doing the race just like everyone else. It was truly one of the most inspiring things I’ve ever seen at a race of any kind. So don’t discount the importance and fun of exercising and playing with kids. It helps you by keeping your spirit and body young, it helps them with confidence, outside-the-box thinking, social growth and health, and it makes the whole family unit so much more fun and close! ← Are you moving efficiently enough to save your life?